www.ascpskincare.com 33 Results Oriented Teach your clients the importance of home care by Mark Lees, PhD expertadvice SKIN SOLUTIONS If you were sick and went to the doctor and they told you to take prescription medication to get better, would you? What if your doctor told you what was wrong, but didn't tell you what to do at home? As estheticians, we are not only professionals who administer treatments that make skin look and feel good, we are also responsible for telling our clients what to do at home to keep their skin clear, smooth, healthy, and beautiful. If you go to a personal trainer once a week or so, and do nothing between visits, will you have good workout results? Of course not! 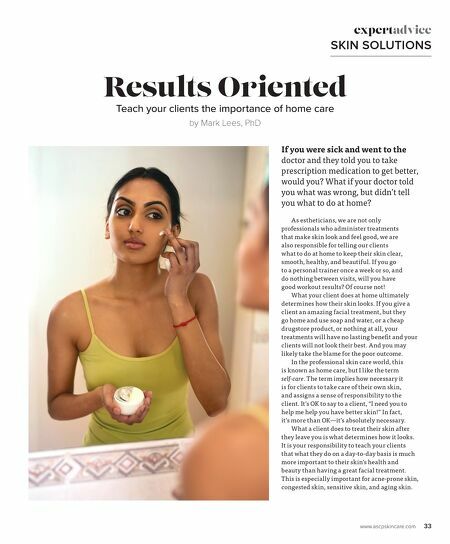 What your client does at home ultimately determines how their skin looks. If you give a client an amazing facial treatment, but they go home and use soap and water, or a cheap drugstore product, or nothing at all, your treatments will have no lasting benefit and your clients will not look their best. And you may likely take the blame for the poor outcome. In the professional skin care world, this is known as home care, but I like the term self-care. The term implies how necessary it is for clients to take care of their own skin, and assigns a sense of responsibility to the client. It's OK to say to a client, "I need you to help me help you have better skin!" In fact, it's more than OK—it's absolutely necessary. What a client does to treat their skin after they leave you is what determines how it looks. It is your responsibility to teach your clients that what they do on a day-to-day basis is much more important to their skin's health and beauty than having a great facial treatment. This is especially important for acne-prone skin, congested skin, sensitive skin, and aging skin.